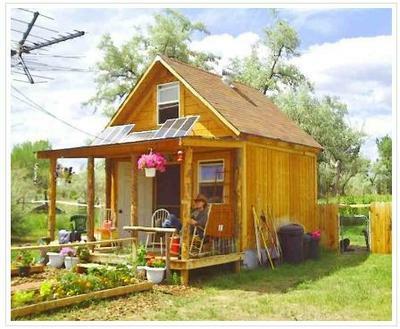 Hey folks, I am a long time off-grid homesteader and this is my 14x14 off-grid cabin near the Uintah mountains. I live full time in the cabin and it has a kitchen, bathroom and living area downstairs and a full loft with bedroom and office upstairs. I power the cabin with a 580 watt solar and 400 watt wind turbine. I use a solar composting toilet of my own design and lots of passive solar features. Heat is a small wood stove with propane backup and an OD water heater. I am a semi-retired teacher, writer, photographer, and adventurer and I design small off-grid cabins. My book "Ultimate Off-Grid Guide" and my videos of my cabin and systems might help people wanting to learn about off-grid homesteading from someone that has done it for a long time. They are available on my website: http://www.simplesolarhomesteading.com and http://www.youtube.com/solarcabin. know more about your off-grid home. How did you handle water and sewer? Thanks again! years but my wife just couldn't see doing it. & she seems way more open minded about it. as you have it set up now? And what runs constantly? Can I see pics of your place? I live in the area and have been looking into small houses. I would love to see the house layout plans for this little house. I like the 14x14 size!